The state of Indiana is suing the former owner of a hotel over a policy to charge guests $350 for making “disparag[ing]” public comments about the business. According to the state’s attorney general’s office, Katrina Arthur wrote a negative online review of Abbey Inn and Suites in March 2016. The hotel room, she says, was filthy, but hotel staff never responded to requests to clean it. Days after checking out, Arthur says she received a $350 credit card charge for leaving a negative review. Indiana argues this violates the state’s deceptive consumer sales act. The lawsuit filed December 14th calls out Andrew Szakaly, who owned the hotel at the time, for an “unfair, abusive, and deceptive” policy of charging guests $350 for leaving negative reviews. The state seeks to reimburse Arthur for the $350 charge and bar the hotel from enforcing the policy. Szakaly, however, is no longer the hotel’s owner. In January, Amanda Sweet and her husband took ownership of the hotel and began renovations. But, in the past week, news of the suit has spread, leading people outraged by the former owner’s behavior to flood their Yelp page with negative reviews. In response, Yelp is currently removing posts “that appear to be motivated more by the news coverage itself than the reviewer’s personal consumer experience,” but a number are still visible. Speaking to the Associated Press, Sweet said the negative reviews have seriously impacted the hotel’s reputation. 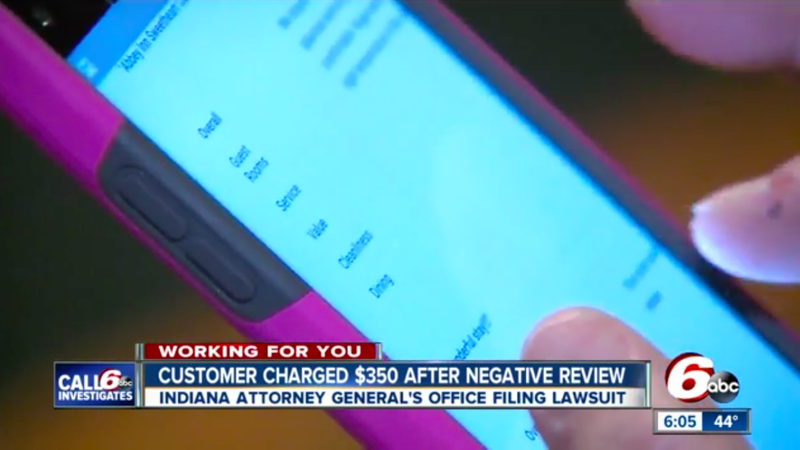 Sweet, who is not named in the suit, has no policy charging customers for negative reviews. Online reputations can be the lifeblood of small businesses and, as you’d expect, people go all out to protect them. 28 states have enacted laws that stop business owners from employing anti-negative review policies.